In uefi mode, wimboot does not appear to tolerate files with different than expected being mapped. It is expecting boot.wim and the original file being mapped as boot.wim must also be named boot.wim. Give it a go and feedback. EDIT - this needs further experimentation. My own UEFI system appears to have poorly implemented UEFI - e.g. no firmware support for network boot unless CSM is enabled. Let me try again, I never previously used UEFI, hence the previous setup was not anything I tested. And use my ipxe script as is. Only update the ip, nothing else. Use my bcd as well. I can't remember whether a wim file not using the default/standard boot.wim naming convention worked at all - even when the BCD store specified the different name. Hope this makes sense. No, the layout makes no difference, that is not the issue! In uefi mode, wimboot does not appear to tolerate files with different than expected being mapped. Absolutely SPOT on, thanks. I could not find this info anywhere else! Can you summarize what was your issue and detail your corrective actions ? If your ipxe script was the issue, following my advice in post #27, should have done the trick. Could you please trying using create_bcd_reg.cmd by NiKiZe to generate your bcd files? I can't believe cdob didn't come up with this. Edited by ndog37, 19 February 2017 - 11:56 AM. What does this batch which you cannot do with bcdedit? Also, I miss the nointegritychecks option in the bcd you point to. Why not simply use the bcd which comes with winpe or window dvd/iso ? P.s. erwan is correct - using the BCD store from WinPE or Windows DVD/ISO sources will also work fine. P.p.s. My store is also missing the nointegritychecks option - it was still working fine in the VMs I used for testing. Will retest later (I'm currently on a tea break from decorating! ), however I'm sure I tested the BCD without nointegritychecks in VMWare Player using a VM in UEFI mode. Enjoy your tea break : UK tea is best ! About nointegritychecks, see original discussion here. -without secureboot enabled, you can boot an unsigned bootloader (IPXE) only if nointegritychecks=yes or else you get "error code 0xc0000428 (The digital signature for this file couldn’t be verified).". Disables integrity checks. Cannot be set when secure boot is enabled. This value is ignored by Windows 7 and Windows 8. 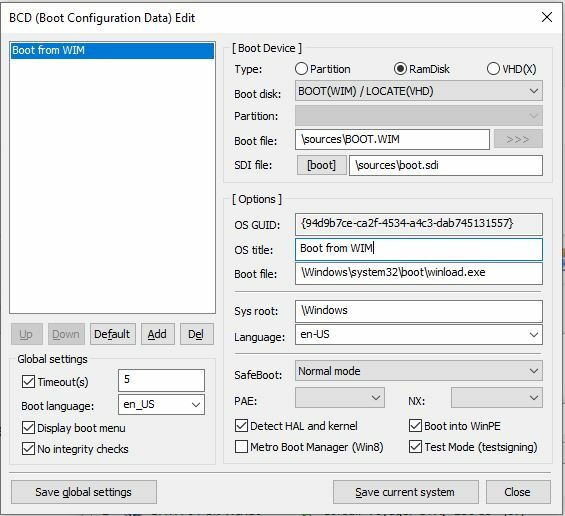 The solution in my case was to add the --name option to the initrd command - boot.wim definitely requires this set when using UEFI boot. Can you post the COMPLETE entry that is working? About winboot and UEFI, a must have reading : http://mistyprojects...npe_wimboot.htm . And specially the virtual names part. Although the solution provided by Misty in post 28 (and confirmed by Sebus) does not use --name. The original issue (see post 26) was about using a renamed boot.wim files. It is only when the name of the served file differs from the "expected" name that the -n or --name option is useful. It means the filename used in the virtual filesystem that wimboot creates. Then what is the "real_name"? It means the actual filename (and path, if not the same of where the ipxe script is) of the actual file on the server. Where are the "virtual_names" files available (in the served "virtual" filesystem)? What are allowed (and accepted) "virtual_names"? Too bad the forum formatting halfly killed your demonstration (hence the "code" markup ) but indeed you are right : the --name should only be used if you intend to use a real (file) name which is different from what is actually expected by the loader. The latter solution being convenient as you dont have you actually rename your files thanks to "virtual names". Also worth mentionning some wimboot documenation : here. Hopefully "fixed" using hxxp . Your "extended" answer is more limited than Misty's explanation (on the given page). will work fine in both UEFI and BIOS because "virtual_name" and "real_name" are the same. The problem happens only in UEFI mode - somehow the boot.wim absolutely requires the --name setting. This is right back to the possible misunderstanding (what I was trying to disambiguate), the -n or --name setting is NOT needed for the "boot.wim", it is needed for the "winre-20180614.wim" which is a RENAMED "boot.wim" (and this happens only on UEFI). If your "boot.wim" is renamed to anything else BUT "boot.wim", then the --name boot.wim or -n boot.wim is needed, otherwise it is not. Since both the BCD and the boot.sdi are still called BCD and boot.sdi (respectively) the -n or --name option should not be needed for those two files (having them won't do any harm, however ). I would need to retest to confirm, however I vaguely recall that the --n (or --name) option was required even when boot.wim was not renamed. I'm not in a position to retest at the moment. And there may have been a number of variables at play including my access to a very limited range of hardware with UEFI firmware. And an older version of wimboot (circa early 2017). Well, , using the "original" as "real_name" is the actual solution you suggested and that Sebus confirmed to be working, (post #28, #30 and #32). should work BOTH in BIOS and UEFI, the first one tested and confirmed by StanislavKogan, the second tested and confirmed by Sebus. BTW in the meantime it is also possible that wimboot itself has been changed, at face value it is "queer" that there are two different sintaxes/parsing methods for BIOS and UEFI booting. Or maybe they didn't care/notice. When UEFI booting, it seems to need a BCD file passed to it using initrd (unlike Legacy booting). Also the BCD MUST be configured with the 'standard' path to the wim file of \sources\boot.wim regardless of where the wim file actually is. Beware as some dual-boot (32+64-bit) ISOs will not use these paths in the BCD, so check the BCD that you use! Some other paths also seem to work too such as \boot.wim. Otherwise BSOD error 0xc000000f ! Edited by steve6375, 4 weeks ago.